Rode that road, a few times now, and in the rainy season it gets deceptively treacherous…gotta watch the permanently-shaded areas and painted lines. If you’ve been following along this year, I’ve been mentioning tuned rides, and complained about the lack of tires for roadies. Get on a new 27.5+ plus MTB bike, and you should get what I mean. It’s all about the contact patch and roadies are riding on one the size of a dime. Whenever the aero road bike arms race ends, let’s hope product managers turn their attention to traction, and how that makes us go faster, and stick to the road; even in the backstabbing slick of the wet winter Pacific Northwest. The most and widest rubber that’ll fit into your frame is what I’m riding and recommend you do too. Many factors contributed to a change from road bikes with skinny tires at 160PSI to a min of 25 wide at 100 psi. Ride quality is one of them, taking off the edge of that overly stiff bike, but also better grip. The best way to avoid flats too, and I’ve tried them all, is to stay out of the gutter and put quality, thick rubber on your wheels. Recently Zipp upped their game with wheels and tires that compliment each other’s girth. This has the benefits of a wheel that really rolls, as I shared in that story from Maui last year, but also the grip I want in the Winter. Locals maybe thinking, running good tires in the Winter? Yes, ‘cause SEE PHOTO ABOVE. If I shared this location with you, we’d stop mid apex, clip out, and step carefully on the road, and try not to slip. 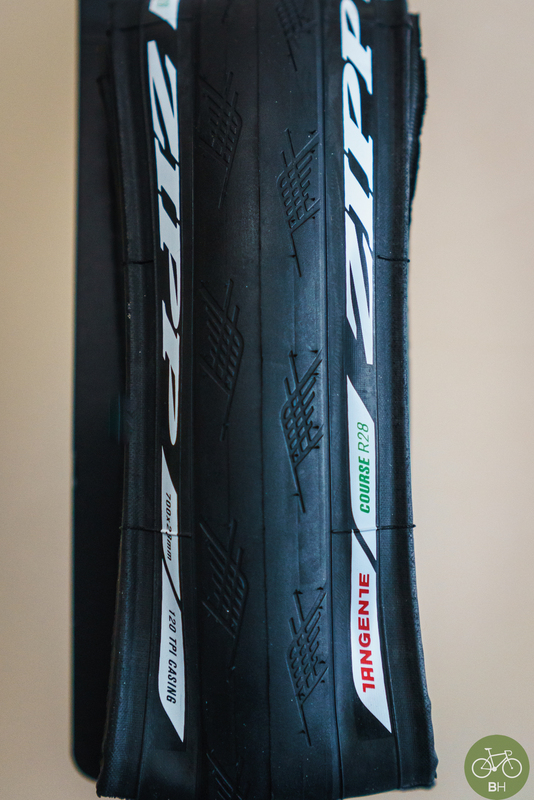 The Zipp Tangete Course 28s retail for $65.00 USD and are available from a shop near you or online. I run them at no more than 100 psi, when I descended that corner earlier this week, they were at about 85 PSI. The Tangete Courses are on my rain bike, it’s built up with SRAM Force 22 and a Quarq. Parse those bullet points to mean: a high quality, rainy conditions tire, with high volume for a comfortable ride. HT to Ben Moses for the edits on the road photo. Thanks Ben!